HomeBaby name consultant: Isabel, Maggie, Julia, Olivia, or … ? Baby name consultant: Isabel, Maggie, Julia, Olivia, or … ? “Lately, I have been favoring Isabel, although one of my best friends has a daughter with the same name, so I am slightly hesitant to use it. I also wonder if it would fit with the style of our other children’s names? My husband’s favorite of the list is Maggie. I like it and definitely think it would fit well with our other kids’ names, but I also think it is a tiny bit boring (no offense to any Maggies out there). We like the name Julia, but our kids have a cousin named Julia. She’s a little bit older than they are and lives in a different state, but nonetheless, I’m still unsure if we should use it. A few names that we like, but that are out for various reasons: Genevieve, Josephine, Emma (and Emily), Amelia, Lily, Madeline, Catherine and any variation of Mary (sad, I know, but my husband has a sister named Mary and refuses to use the name because of her). I also want to try to stay away from another Old Testament girl’s name, despite the fact that there are a few I like. We are also stuck on a middle name. I was rooting for Faustina, but my husband says “no way.” I also like the more common Grace and Rose, but we would prefer a strong feminine saint name. We were thinking of Avila or Siena. What do you think? Isabel is lovely! It’s my favorite of the Isabel(le/a) names, sweet and sophisticated all in one. Regarding whether it fits with the other kids’ names — you all know that I usually start my consultations with the Baby Name Wizard book as it offers, for each entry, boy and girl names that are similar in style/feel/popularity. According to the BNW, Isabel definitely fits with the other kids! It’s listed as similar to both Lily and Madelyn, which are similar to all three of your kids’ names. Nice job, Jennie and Matthew! The other kids’ names are all biblical, but then Isabel is too, as it’s a form of Elizabeth. It’s a nice way to take their style in a new direction. I will just caution that since Elizabeth has already been used as Abby’s middle name, namiacs (like me) would notice that you technically used the name twice, but there’s certainly no rule against it, and most people will never know Abby’s middle (unless they/she tells them), and Elizabeth and Isabel look so different that many may never even notice. Re: Margaret/Maggie, I agree Maggie is just adorable. I wonder, if Jennie worries that Maggie is too boring, if Magdalene or Magdalena would spice it up enough for her? It’s a New Testament name, so like with Isabel, it adheres to their established style while also taking it in a new direction. And Madeline is a variant of Magdalene, so it would kind of like be using Madeline (which Jennie said she liked) but not (since she said they couldn’t use it). Though Maggie could be the everyday nickname, Jennie would have the fun of knowing that the full first name is unexpected. So really, of their three current ideas, I don’t think they can go wrong!!! Charlotte and Caroline were all over the spreadsheet I made of my research for this baby! They, as a name family, had hands down the most similarity to the names Jennie and Matthew like than any other name. Even the nickname Callie was included, showing up as similar to Maggie. I love these names because of their connection to St. John Paul (born Karol=Charles), and I know a bunch of people who have considered and/or used Karoline or Karolina, so that’s an option as well. Helen, Helena, and Eleanor all share similar sounds and nicknames, so I’m grouping them together here. They all did quite well in my research, as did Ellie and Ella. St. Helena is a great patron saint for a little girl too, so if you didn’t care for it in the first name spot, maybe in the middle, since she was a strong female saint? I started with Olivia, because it was the only name that fit all three of the other kids’ names’ style, and then listed the name that had the most similarity to Jennie and Matthew’s entire name list (Charlotte/Caroline), then the second most (Helena/Eleanor), and now the third most – both Sofia and Sophie scored high for this family, with Sophie being just a bit closer to their style. As with Olivia, Sophie isn’t a biblical name, but it is a biblical idea – there’s even a book of the bible named Wisdom. St. Madeleine Sophie Barat is also a great saint, so maybe Sophie as a middle name if they didn’t care for it as a first? I loooooove the idea of Olivia Benedicta!! What a great combo!! I would absolutely encourage Jennie and Matthew with this choice — I love the much-beloved and familiar Olivia paired with the heavy duty Benedicta, just wonderful!! It too can take the nicknames Liv and Livvy (you all know how I am about nicknames! And Liv/Livvy is my favorite part of Olivia — they’re just so sweet! So being able to retain the nicks even while using a different name would be a plus for me). So those are all my ideas/thoughts/suggestions! What do you all think? What comments do you have about the current ideas (including Olivia Benedicta), and what other suggestions do you have for Jennie and Matthew? I personally don’t like Olivia Benedicta together because of the two A endings–it makes it a little sing-songy to my ear. Olive Benedicta has a better flow, to me at least, and is just super cute and retro-sounding to boot! Yeah, the -a -a thing does bother some people, and certain combos I don’t love because of it … I don’t mind it here, but I can see why you might! Olive Benedicta is really sweet! I was about to just suggest Olive as well! I LOVE that name! How about Margaret as a full name for Maggie? Honestly, popularity isn’t a huge consideration for us when choosing names. We named our oldest son one of the top 5 boy names and we’ve yet to meet another kid in his age group with his name. 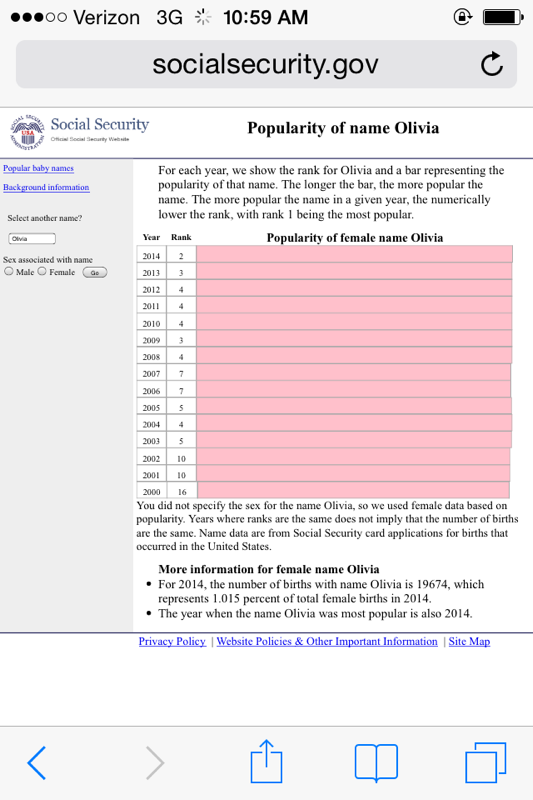 You could look at the popularity of Olivia in your state; it could be less common in your area than it is in others. Or what about switching the two and going with Benedicta Olivia? 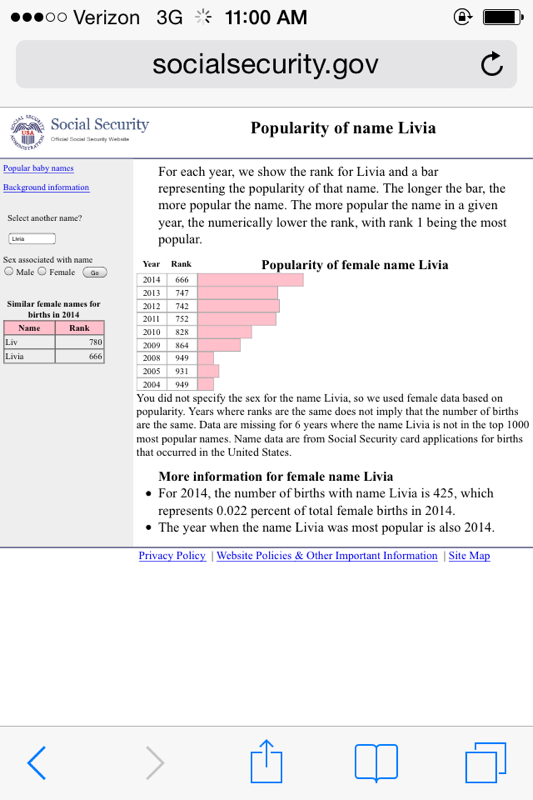 You could still nickname her Livia or Liv or whatnot, but if the popularity of Olivia becomes an issue at some point she could go by her first name. Thank you for all the suggestions! I do love Rosalie, it’s such a beautiful name! These are right in the same line the husband and I have been thinking…saving this post to show him! A flowery vintage strong name? I immediately thought Viola. But then I saw the possibility of Avila for a middle name, which sent me to Spanish forms of Theresa. I always find Theresa a bit dowdy) — but Tereysa, Tarasia, and Tareza are all lovely. Ahh! Pets’ names so often present a conundrum!! Hahaha! My family and I do too. 😉 Olive Anne is quite nice! I love the idea of Olivia! What about maybe Violet? I think that would be really cute, and could go with some of the middle names they like (Violet Faustina would be gorgeous! and because Violet is more common, it could balance out the uniqueness of Faustina). They do, right? Lovely taste! Violet Faustina is goorgeous, and Violet has so many of the Olivia sounds — great suggestion! Thank you! Violet is another beautiful suggestion! 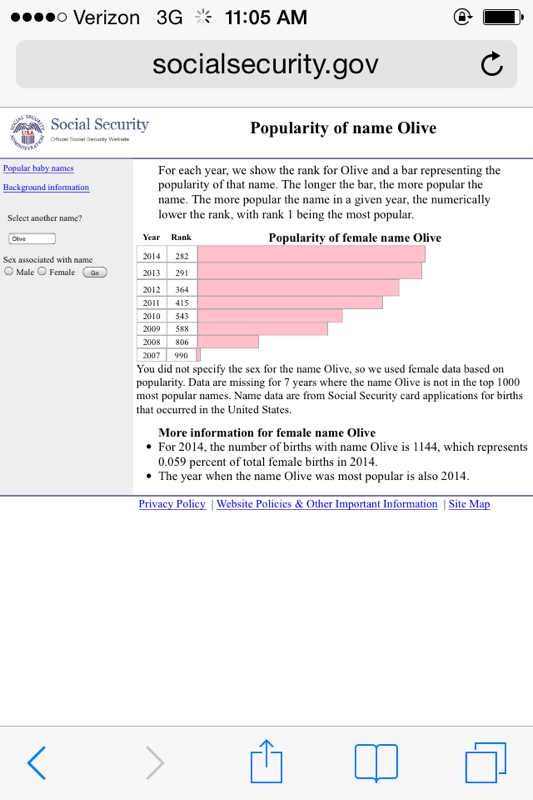 If Olivia is the name that speaks to them, they should use it despite the popularity. It just means lots of other people share the same great taste. Besides, their other children have fairly popular names too. I think Olivia Benedicta is lovely and with the sentiment behind it, you can’t go wrong. I too think, if they love it they should use it! I think they have found a great combo in Olivia Benedicta and should use it! There other girls have popular names so I think Olivia fits in beautifully. The name Olive has a very different vibe. I agree, I think Olivia’s a great fit for them. Ohmygoodness that’s awesome!!! I never knew that!!! This is so good to know! Love it! Going through my old school files for mid-century names, I found an old report card signed by our principal, Sister Mary Olive. It reminded me that I had meant to post that here. When I first heard her name thought that it was strange – “olive” for a nun? But when I learned of this title for Our Lady at that time, it made sense. It is an awesome patronage and beautiful image. Sr. Mary Olive, that’s awesome. I’m so impressed that she chose it for Our Lady of the Olives, I’d never heard of that title until one of the recent consultations here. Beautiful! Whoops, that the double -a endings aren’t too much. Hi everyone, this is Jennie (the mama to baby girl yet to be named). Thank you so much for all your advice and suggestions! It’s been so helpful to get Kate’s analysis on our baby name dilemma and I’ve loved to hear your feedback and encouragement on the names we’re considering. We will certainly keep you posted when the little miss arrives and on what name we eventually decide upon. God bless!